Spring has arrived with rain and warmer temperatures. This brings out the shelf mushroom crops. A storm several years ago knocked over this large tree down by the river. The road crew cut it up and rolled the pieces off the road and into the edge of the woods. Walking by I noticed the crop of shelf mushrooms. The fresh ones are light in color. As they age, they darken. All are tough. There are many kinds of shelf mushrooms. They are not all in the same mushroom groups for many reasons. I’m not very knowledgeable about mushrooms so I tend to look at them the same way. The size of the fan may vary. The thickness may vary. The edge may be smooth or ruffled. All shelf mushrooms are semicircles. The shelf mushrooms I see are on dead or dying trees. They jut out with a half to two thirds circular shelf. Underneath is a stem joining the shelf to the tree. This shelf mushroom has gills under its cap. Some of the shelves have gills under them. Others have pores that look like tiny holes under them. This is why they are split into different groups. 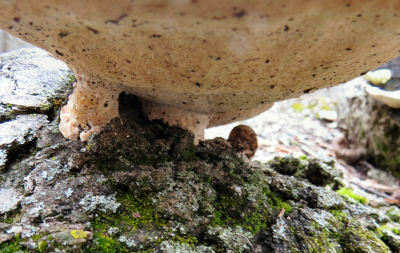 Under this shelf mushroom cap is a spongy surface of pores. The shelves are different. Some are thick and woody. Some are thin. Some are in piles. Others are separate. Some are pink or blue or lined. Size varies too. Some are barely an inch across. Others are small plates. Some of these mushrooms are found only in particular seasons. Others can show up anytime after a nice, warm rain. I think this is a mound of salmon shelf mushrooms. They were on a tree stump. They are supposed to be edible, but I hesitated as I wasn’t positive of my identification. 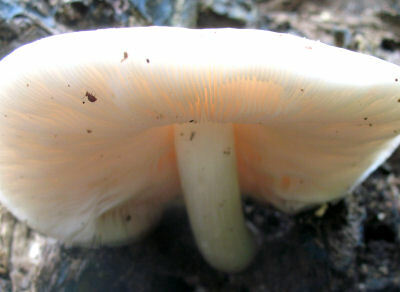 People do eat some of the shelf mushrooms. 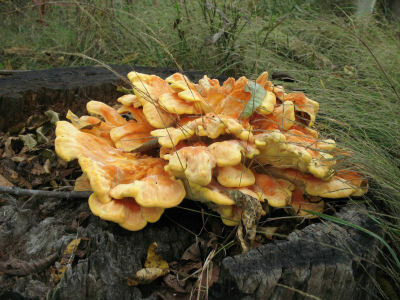 Chicken of the Woods and Oyster Mushrooms are two of the favorites. These are fairly easy to identify definitely. Some of these mushrooms are poisonous. 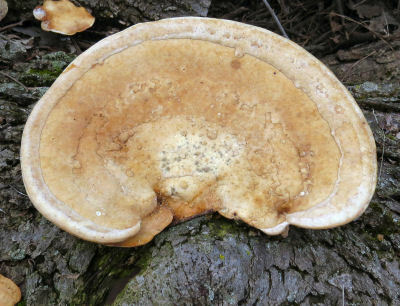 Most are ones no one would want to eat due to bitter flavor or woody texture. For myself, I don’t hunt for shelf mushrooms to eat. I browse through the mushroom guides and see that many of the edible ones are too easy to confuse with others listed as not edible. 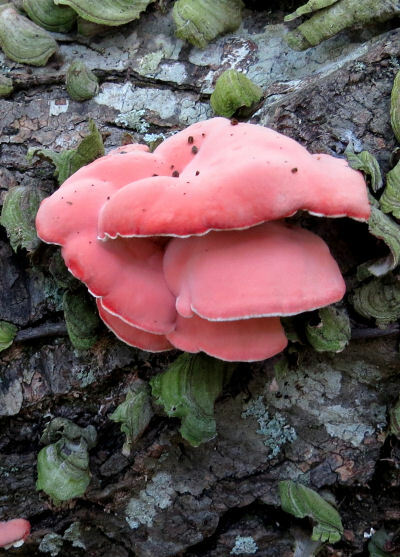 The soft pink color seems to glow for these shelf mushrooms on a fallen log. A trusted friend did give me some Chicken of the Woods once. 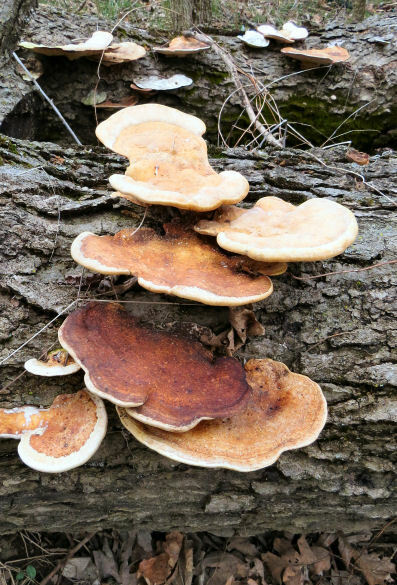 This shelf mushroom can form huge piles of shelves. It was good. I don’t trust myself to identify it on my own. Spring brings up many mushrooms much easier to identify. Another month brings morel season. That is one mushroom I can identify confidently. This entry was posted in Uncategorized on March 27, 2019 by [email protected].